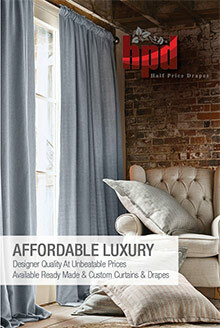 Discount Drapes and Curtains - At Half Price Drapes they believe that a window should never be left undressed. Deliver a contemporary look to any room for less with discount drapes and curtains that will add an instant touch of elegance. From solid silk and faux silk curtains to plush velvet and printed cotton drapes, you'll find a selection of discount draperies that are tailored from the finest fabrics and able to meet any home decorating budget. Silk and Faux Silk Window Drapes and Curtains - From solid Thai silk curtains in ruched and banded styles to patterned and embroidered curtains and Italian silk cotton drapes, you'll find an ornate assortment of fine silks to choose from. Half Price Drapes also brings you a selection of faux silk discount draperies with solid and striped taffeta curtains and drapes that look and feel just as luxurious as the real thing for only a fraction of the price. Linen and Cotton Discount Draperies - Whether you're searching for new set of discount draperies for the dining room, master bedroom, kitchen or family room, Half Price Drapes lavishes your home with a distinctive array of window drapes and curtains that are the right fit for any room with a view. Find hand weaved cotton curtains, Belgium linen, cotton jacquard and more discount drapes and curtains that feature a sophisticated finish with weighted hems and shade-enhancing linings. Window Drapes and Curtain Rods and Accessories - Besides providing you with quality discount drapes and curtains for every room of your home, HPD also features a full signature line of curtain rods and accessories that will perfect your window treatments while bringing the entire look together. You'll find essential hardware including elegant curtain tassels and tiebacks, finials, wooden brackets, rings, poles and adjustable iron rods that will give you the right length for any window dressing. Half Price Drapes has been committed to providing the highest quality discount window treatments at the lowest prices available. Indulge in discount drapes and curtains available in decadent silk and faux silk curtain varieties, rich velvet curtains, refined linen and cotton drapes, curtain rods, accessories and more discount draperies in a variety of stylish fabrics in every price range.